One of the first jobs that Brodnax 21C Printers, of Dallas, produced on its MGI JETvarnish 3D digital enhancement system was a 50th-anniversary poster for the Dallas Society of Visual Communications, which Brodnax supports as a sustaining member. The assignment, recalls Jim Singer, managing partner of Brodnax, called for the intricately styled poster to be embellished with foil across its entire 20x26˝ layout: a requirement that would have involved $8,000 to $10,000 worth of diemaking charges if the foil were applied with conventional equipment. What’s more, says Singer, “there’s not a letterpress in the universe that could have gotten all that foil to release properly.” That’s why Brodnax turned to its JETvarnish 3D, a multi-capable enhancement platform for digitally controlled hot foiling, 2D and 3D varnish and embossing, among other special effects. 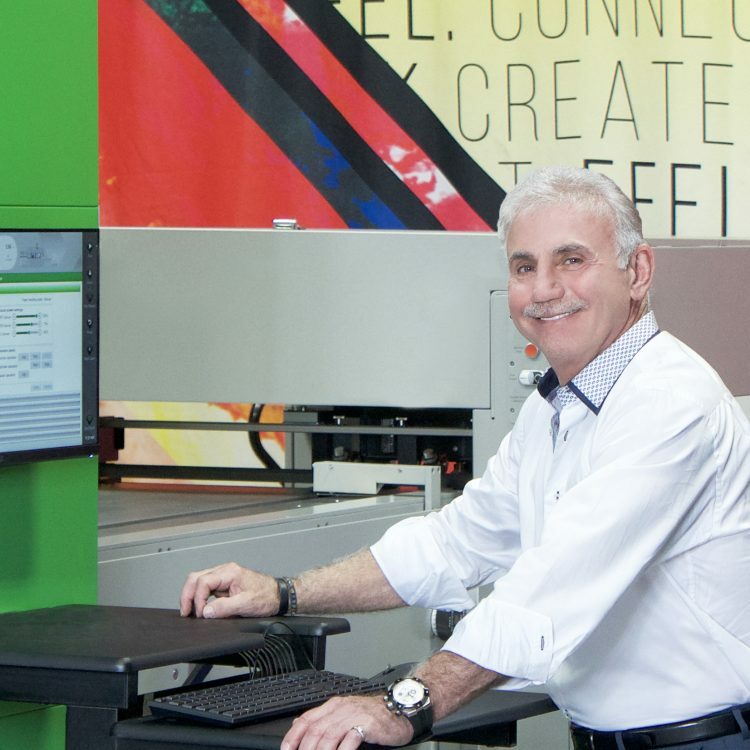 With the help of a digitally controlled MGI JETvarnish 3D digital enhancement system at Brodnax 21C Printers, reports Managing Partner Jim Singer, “we’re using 1s and 0s” instead of analog processes to set up foiling and spot UV jobs. Print enhancement makes money for printers: it’s a truth and a high note that this article could end on right here (but won’t, as it has more success stories to report). Brands are demanding it; customers are prepared to pay for it; and print service providers, thanks to innovations from MGI and other vendors, have more ways than ever of delivering it. 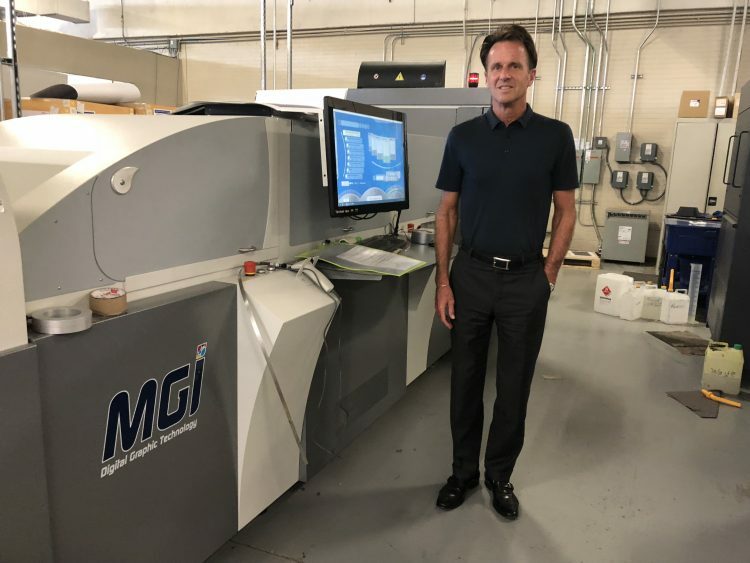 In Chatsworth, Calif., Impress Communications is keeping a Highcon Euclid III digital creasing and cutting system increasingly busy with projects for packaging customers that expect more from enhancement than good looks. Paul Marino, executive director, notes, “A package needs to incorporate the brand’s entire message and must work harder to communicate to consumers,” not just in retail aisles, but during the in-home “unboxing” experiences that millions of online shoppers have come to expect from brands in the age of Amazon. Like other forms of enhancement, ornate, one-of-a-kind diecutting on the Highcon Euclid device “elevates the perceived value of the package” and the product it contains, Marino says. The name of the sweet spot is competitive differentiation, which is what Wallace Carlson achieves with the help of a Komori Lithrone GL840P H-UV press on which it runs jobs prepped for enhancement with the Color-Logic Process Metallic Color System. The company is the only U.S. printer with H-UV capability to be certified by Color-Logic for proper use of the system, according to Cox. That bragging right is also a selling point. A client that “went bonkers” with delight upon learning that it could get all the special effects it wanted on a holiday catalog in one pass on the Lithrone GL840P has more work of this type lined up for the press and the Color-Logic technology, Cox says. According to Paul Marino, Impress Communications is keeping its Highcon Euclid III digital creasing and cutting system busy with projects for packaging customers. Likewise, special effects are in such demand by the customers of Utah PaperBox that the Salt Lake City-based printer sometimes runs cold foil jobs for a straight week at a time to stay ahead of the workload, according to Steve Keyser, CEO. The sheetfed press platforms are a 56˝ manroland 909 and a 40˝ manroland 700, both in seven-color configurations with dual coaters. The larger of the two presses has an in-line cold foiling unit from Eagle Systems. Utah PaperBox is also a boutique for specialty print fluids, offering 20 different kinds of coatings and varnishes and operating 15 anilox rollers on various pieces of equipment to dispense them. “It’s almost too much,” Keyser confesses — but when it comes to print enhancement, there may be no such thing as a surfeit of variety. This is because an avid market exists for the value that print enhancement is widely perceived to add. InfoTrends has estimated that 30% of offset printed color pages have some type of enhancement beyond the four process colors, amounting to more than 1 trillion enhanced offset pages in all. Fewer digital print pages (less than 3%) are embellished, but therein lies the growth opportunity given print buyers’ strong inclination to pay for enhancement when it’s available to them. How strong? In interviews, more than 100 print customers demonstrated what InfoTrends regarded as “an appetite and a willingness” to pay premiums of 24% to 89% over CMYK-only printing for special effects. The customers also indicated that print enhancements could apply to a significant amount of their work. Printers selling enhancements to their customers know the appetite to be healthy. “For those truly committed to their brands, price isn’t a driving concern,” Marino asserts. “We’re not selling a price — we’re selling a result: an emotional response for their customers.” He explains that when brand owners see incremental sales increases more than offsetting the premium they paid for enhancement, they embrace “a completely different thought process” about investing in it. Having seen what the Color-Logic system was capable of, Wallace Carlson’s holiday catalog customer dropped any objection it may have had to the material cost, Cox notes. A more meaningful point to make about enhancement is how it drives costs out of value-adding production and makes workflows more efficient. In running the digitally controlled MGI JETvarnish 3D system at Brodnax, Singer says, “we’re using 1s and 0s” instead of dies and screens to set up foiling and spot UV jobs. This lets the system enhance every type of printing Brodnax produces — lithographic, digital and wide-format — with equal precision and ease. The beauty of in-line cold foiling, Keyser notes, is the savings it offers compared with off-press hot stamping and its associated diemaking charges. One customer, he says, was spending $78,000 per year on stamping dies until cold foiling began making it possible to replace that tooling with a simple press plate. Keyser adds that cold foiling, which accounts for 70% of the foil applications that Utah PaperBox produces, also eliminates the registration issues that sometimes arise with hot stamping. Marino makes a similar point about diecutting, which has gained a new dimension of creativity at Impress Communications during the year that the Highcon Euclid III has been in operation there. Marino says that although conventional diecutting remains highly useful, it has “limitations and constraints” when it comes to matching dies to creative concepts. “You can only bend metal so far, and so consistently,” he points out, before the outlines of a complex design defeat the diemaking process. diecut,” according to Marino. The system can also cut variably and laser-etch designs into substrates for one-of-a-kind special effects. Marino acknowledges that with capabilities this new to the market, there’ll be an “awareness gap” to fill before customers can fully appreciate what enhancement with laser diecutting can do for them and their brands. This points to the fact that while enhancement sells, it doesn’t sell itself — printers have to familiarize their customers with it and help them leverage the benefits of using it. “It’s always about the return,” Singer says, noting that what marketers want is the lift in response rates that enhanced mailing pieces are known to generate when their content is targeted and relevant. As a producer of up to 7 million direct mail pieces per month, Brodnax has seen what the dual impact of relevance and visual flair can do. One customer, Singer adds, got a 400% bounce in membership conversions by decorating a St. Valentine’s Day promotion with silver hearts. Make sure the sales staff has samples of live work that show off the enhancement options available to customers, Keyser advises. Do “more showing than telling” with high-end specimens that speak for themselves, Marino agrees. Cox says he likes to promote Wallace Carlson’s enhancement credentials on social media, including videos posted to LinkedIn. But there may be no better way to promote enhancements than to open the doors of the plants where it is being done. After an open-house event at Utah PaperBox in August, Keyser says, “lightbulbs went on” in visitors’ minds about the magic that can be done with artful combinations of color, coatings and foil. Marino says that this year, Impress Communications has hosted two such events: one for designers and another for local printers wishing to source laser diecutting and other special effects from Impress as trade services. Maintaining a clean, up-to-date plant is sine qua non for showing off a company’s enhancement capabilities to their best advantage, according to Cox, who organizes tours and lunch-and-learns at Wallace Carlson. “People trust having their high-end work done in a facility that shows well."